The Lenovo K8 is similar to the K8 Plus except for the dual-camera setup on the back. 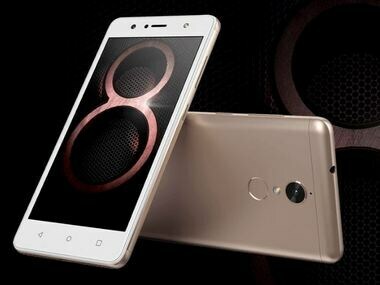 Lenovo has unveiled its new K8 smartphone in India at an introductory price of Rs 10,499. The phone sports a similar design to the K8 Plus which was launched earlier this month, except for the fact that the latter had dual camera while the K8 will have single camera at the back. The Lenovo K8 has a 5.2-inch HD display. In terms of its specs, the phone has an octa-core MediaTek Helio P20 processor paired alongside a Mali MP2 GPU. The phone has 3 GB of RAM and 32 GB of internal storage, which can be expanded via a microSD card. In terms of software, the phone will be running the Android 7.1.1 Nougat. In the camera department, the phone has a 13 MP rear camera with PDAF and LED flash. On the front is 8 MP selfie camera. The rear part of the phone also houses the fingerprint sensor which is located just below the flash unit. The phone has massive 4,000 mAh battery which the company claims can last for up to 2 days of normal use. The phone has dual-SIM 4G VoLTE capabilities, Bluetooth support, GPS, Wi-Fi and micro-USB port as connectivity options. The phone will be available in Venom Black and Fine gold colour options.